Though downtown's renaissance continues, you sometimes feel you've seen it all. You've had your regal-classic evenings at the Biltmore, conducted your field research on the astounding coifs at the Standard, and surveyed the best of the rest (aka Seven Grand). Sounds like you're ready to experiment. We suggest an under-the-radar tapas discovery (despite its unfortunate name): Oh! Restaurant and Bar inside the O Hotel. 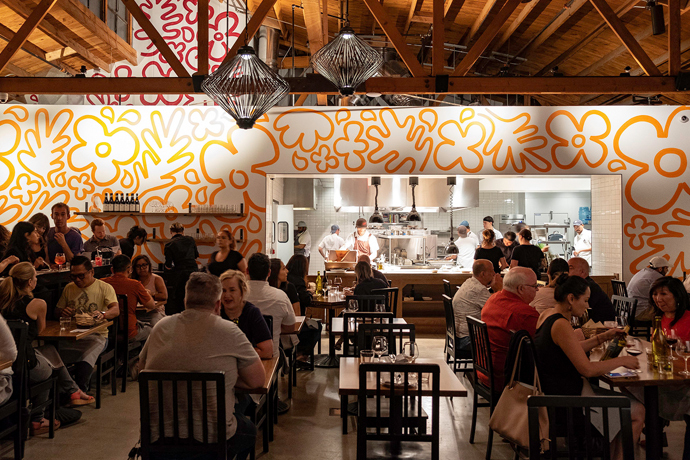 Serving regular fare throughout the day, the restaurant beefs up the menu with small plates around sundown in an effort to lure you over before a Staples Center game or L.A. Live show. In addition to four different tasting options and entrees like Branzino and Moorish Lamb, you'll find a tapas list including Gypsy Clams, Blue Gnocchi and Patatas Bravisimas. The chef also has a secret specialty involving rabbit, if you know to ask for it (so now you do). Drinks are now being served, and food service should be in place by Halloween. But a separate 7,000-square-foot lounge will also follow soon with a chilly walk-in vodka locker. Inside, regulars and VIPs will have the first shot—literally—at stepping in, sampling, and getting out quickly. Or bringing a parka and setting up shop.